Miguel Alvarez, in the middle, with his former boss, Ricardo Alarcon (right). Today's prisoner is Miguel Alvarez and his wife Mercedes Arce. Alvarez and Arce are not typical of the Cuban political prisoners usually profiled on Uncommon Sense, in that he formerly was a top official of the dictatorship who for whatever reason -- his changing political views or he actually did something wrong -- in 2012 he was purged from the regime and later sentenced to a lengthy prison term for unspecified crimes. I am not prepared to say whether Alvarez truly belongs on the list of political prisoners. It is difficult to judge since there was no transparency in the proceedings against him or his wife. 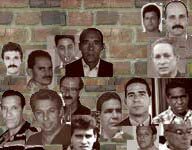 For now, I leave the benefit of the doubt to the human rights commission, which includes on its list of political prisoners the names of several Castro regime officials.